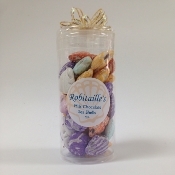 Welcome to Robitaille's Candies online shopping site! We invite you to browse through our store and shop with confidence. We invite you to create an account with us if you like, or shop as a guest. Either way, your shopping cart will be active until you leave the store. All orders are handled on an individual first come first serve basis, filled within three days of receipt and guaranteed to be absolutely fresh. To return to our main page click here.